Rebates Money – Page 2 – Credit Card Promotions, Bank Deals, Chase Coupons, Restaurant Coupons, & Birthday Freebies! Chase Bank is the best at offering special bonus promotions for new account sign-ups. Now is a great time to take advantage of the Chase Savings $300 Coupon when you deposit $25K to the savings account and meeting few simple requirements. Forget those measly free gift promotions and actually make your banking experience worth while with an extra cash bonus! 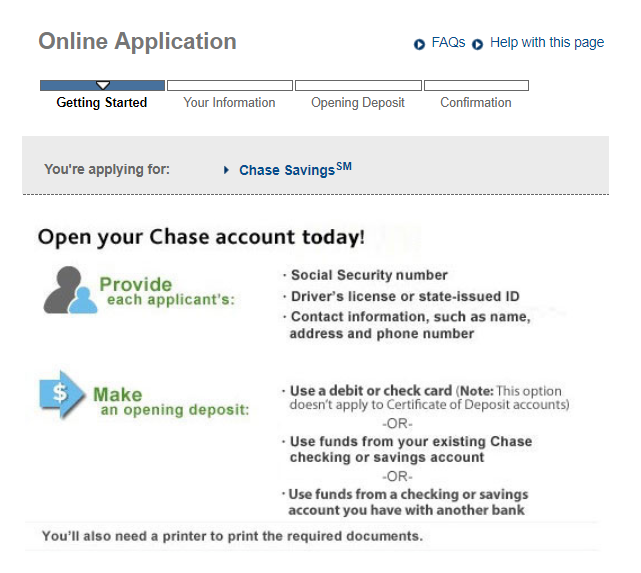 In the past, the Chase coupon offers require you to apply in-branch, not this time. You have the option to apply for the account online, so check it out before it’s too late to earn extra few hundred dollars in your bank account! Now until June 14, 2018, Chase is offering a $300 Savings bonus just by opening a new savings account with and meeting few requirements. To get started, you can either select apply online or enter your email address to receive your $300 Coupon to open in-branch. After you have completed all the above savings requirements, they will deposit the bonus in your new account within 10 business days. All in all, this is a great bonus that is unfortunately hard to come by due to the frequent changes in the offer. The expiration date for the offer lasts until June 14, 2018. When you think about, all you need is to deposit and maintain $25,000 in the savings account. Bonuses are basically a waiting game. You have to make sure that you keep these funds for at least 90 days in order to be eligible for the cash bonuses. Also, be sure to keep your account open for at least 6 months of account opening, or else the bonus will automatically be deducted. If you can’t meet the deposit balance requirement, there is a $200 bonus with $15K deposit instead. Keep in mind you can only receive one new savings account-related bonus per calendar year and only one bonus per account. The bonus is considered interest and will be reported on IRS Form 1099-INT. Overall, it is a great bonus to take advantage of, and if you happen to see this offer at any time don’t hesitate to join Chase! Saving money and getting your moneys worth has never been easier with CIT Bank. Those who open an account with a $100 minimum opening deposit earn up to 1.75% APY! For those who are interested, signing up is a simple 3-step process! Accessing your account is just as easy. Simply download the People Pay app and enter your account info to access your bank account 24/7. Through this app you will be able to withdraw, deposit, and transfer your money. For those who are worried about the security of their online banking, don’t worry! It’s been rated as one of the top 10 online banks of 2018 by GOBankingRates and has been given a 5 out of 5 star rating on its security by Bankrate Safe and Sound. CIT Bank is the online bank that will satisfy your online banking needs and give you rewards that surpass other competing online banks. Are you a a college student and in need of a bank account? Do you hate losing your cash because you don’t have a debit card? Well look no further, because Chase Bank offers exclusive benefits that prioritizes both high school and students, including a $50 cash sign up award! If this is your first time opening up a bank account, don’t worry. There are only a few simplistic steps required to get you and your account up and running! Receive $50 within 10 days, and then spend or save it! It’s such a great feeling to receive free money, but knowing that you now rely on a trusted bank to handle your cash is even more refreshing. Chase Bank offers a variety of special services and features that provide extenuating convenience to all college students. One of them being, that there are no monthly fees for when you have opened a college checking account, so long as you provide proof of student identification. It would be a nuisance to have to pay additional fees just to keep your account running, so thankfully Chase has this feature which will overall save big bucks! Furthermore, Chase Bank has a quick pay feature with Zelle, that allows users to easily send and receive funds through the mobile app, at any time of the day! This is especially convenient for when you forgot your wallet and need to pay a friend back for something. Chase Bank also offers mobile check deposit, as well as direct deposit, so you could easily take a picture of your check through the mobile app without having to go through an actual ATM to receive funds. On top of that, Chase has a 24/7 customer service that will always be ready to answer your questions and satisfy your desires. Sometimes we experience cases in which money is spent without your authorization. Don’t worry, they care about their customers, so in-case of any fraudulent activity you see on your account, the Chase Bank company will be ready to help. Nothing can be more reassuring than to know that your hard earned money is sitting somewhere safe at all times. This is why Chase Bank is one of the top and most successful bank companies in the world, and already has millions of college student users. So don’t waste any more time! Choose the bank company that will always be ready to help. Choose the bank company that cares for your financial well being. Choose the right bank, choose Chase Bank. Obtain a monthly balance of at least $500 in their account. Have a daily balance of $1,500 or more in their account. Have an average daily balance of $5,000 or more in their account combined with another linked Chase account. When opening a new Chase Total Checking Account as a new Chase customer, accounts would be rewarded $200 upon opening if approved. With $25 needed to open up a checking account, the addition of a $200 reward is worthwhile. Nothing is better than free money, so sign up today with Chase and open up your Chase Total checking account to receive a free $200 bonus. Chase is offering business owners nationwide the chance to earn a $200 bonus when you sign up and open a new Chase Business Savings account by April 30, 2018. To qualify for this generous offer, all you would need to do is head on over to your local branch and deposit $15,000 in new money within 10 business days & maintain that balance for 90 days. Once you have met all the above requirements, you will be able to earn the bonus as well as complete access to a wide variety of account features! If you are currently interested in this rather attractive bonus, I recommend you apply as soon as you can. 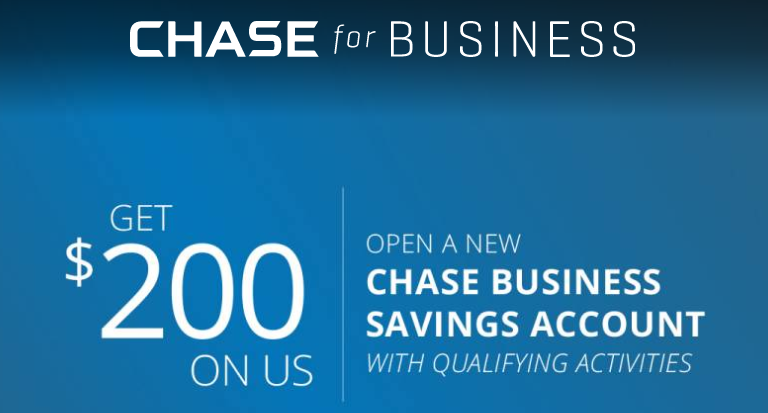 Now until April 30, 2018, Chase is offering a $200 Business savings bonus just by opening a new business account with and meeting few requirements. To get started, simply enter your email address to receive your $200 Coupon then you’ll have to take that coupon into a local branch to take advantage of the offer. Open a new Business Savings account and deposit $15,000 or more in new money within 10 business days and maintain that balance for 90 days. After you have completed all the requirements, Chase will deposit the bonus in your new account within 10 business days. If the savings account is closed by the customer or Chase within six months after opening, Chase will deduct the bonus amount for that account at closing. The Huntington National Bank offers the opportunity for small, upcoming business owners who want to open a new Accelerated Business Checking account and gain up to $500 just by doing so. This would be great for businesses with the average collected monthly balance of $25,000 to $100,000 in the checking account. The amount inside the account will earn interest overtime as well. A total of 600 monthly transactions are included with this checking account. These transactions included, but are not limited to, checks paid, deposit checks, tickets, and debit card payments using Huntington’s Online Bill Pay Service. To qualify for the reward of $500, the account must be created between the promotional period of January 01, 2018 and March 31, 2018. A minimum amount of $25,000 must be deposited and at least 30 transactions must be made within 60 days of the account opening. The account must stay open for at least 90 days. If you choose to close the account early, a fee will be charged and it will void your qualifications for the $500 reward. There will be a small monthly account fee of $30 if you are not able to meet the standard of the average collected monthly balance. Do not worry, this fee can be avoided by following those requirements. Simply click “Email my Coupon!”, take that coupon to a local Huntington National Bank, open an Accelerated Business Checking account, and follow the listed requirements above to make a quick and easy $500. Are you a new business owner looking to open up a Business Checking Account? Huntington Bank is offering $300 for business owners that open a Huntington Fast Track Business Checking Account and deposit at least $5,000 within the first 60 days of opening their account with their coupon during the promotional time period of January 01, 2018 and March 31, 2018. Not only does Huntington Bank offer this great deal for $300, they also offer some of the best account features. Many banks have high service fees, but Huntington Bank allows you to avoid these fees by leaving $5,000 inside the checking account. Skip the paper too! Don’t wait for the banks to mail your statements into your mailbox taking 5-7 days. Huntington Bank offers online bank statements for you to have constant access to. How can you apply for the $300 and an awesome Banking Service? 1. You must open the checking account between the promotional period of January 01, 2018 and March 31, 2018. 2. You must be a new business checking customer. 3. You must reside in the states of Illinois, Indiana, Kentucky, Michigan, Ohio, Pennsylvania, West Virginia or Wisconsin. 4. Use the coupon linked here and present it to your local Huntington Bank. The Wells Fargo Cash Wise Visa Card is a credit card that provides many benefits to the customer when they choose to apply. Not only it gives you cash back and rewards, there are many features this credit card will provide. When applying for the Wells Fargo Credit Card, annual fees aren’t required. According to my past experiences when talking to other companies, additional fees are required when opening up a credit card. This is a hassle to some others while some may not want to pay more fees,which is why the Wells Fargo Credit Card is very beneficial. Another benefit this credit card will provide are rewards. If you spend at least $1000 using the card, you will be able to receive $200 Cash Rewards bonus. Also, when making a pay using Apple or Android Pay, you can earn 1.8% cash rewards for 12 months. To add, you don’t have to worry about finding a Wells Fargo ATM anywhere. There are more than 13,000 Wells Fargo ATM’s nationwide when getting cash redemption from your rewards. Another feature this card will provide are the 1.5% cash rewards earned for every $1 spent in net purchases when using the card. However, you must know that pre-paid gift cards, casino gaming chips, wire transfers, and more will not let you earn cash rewards. The Wells Fargo Credit Card is very safe and protective to use. You don’t have to worry about your card getting stolen or having someone steal your identity because of the chip inserted in the card. Not only this credit card will protect yourself, but on your cell phone as well when you decide to apply for a Wells Fargo Credit Card. You will get up to $600 of protection when you pay your monthly cell phone bill using the credit card. To conclude, the Wells Fargo Credit Card will provide you so many benefits and rewards that will not only help you save money, but is efficient as well. The ATMs will be everywhere and lots of cash rewards will be earned if you spend a specific amount of money or paying with your Wells Fargo credit as described above. As a FDIC insured bank, you are guaranteed the safety of your finances at no extra cost. We are proud to have received the 2017 GOBankingRates Best Banks Award, proving our quality operations and service. Additionally, compared to other big name banks like Chase, Bank of America, and Wells Fargo, you get the most bang for your buck at CIT. It’s super easy and fast to join, so join today for an undeniably great banking experience. Sign up by August 31, and receive $750 on us! Huntington Accelerated Business Checking is the premiere banking experience that will make your business thrive with many of the features that is exclusive only to Huntington. You can have hundreds of transactions free of charge every month. Our customer service operates 24/7 and you can access your checking account at any time with your smart phone, or on the web portal. Huntington works best with small business owners with our overdraft protection. At the end of the day, any money left in your bank account will earn interest, even as a checking account.